The history of diagnoses and treatment of pediatric non-Hodgkin’s lymphomas (NHL) does not only shed light on the progression of cancer medicine but also on the development of modern medicine as such. It was only as late as in the nineteenth century that the term “lymphoma” was coined and used as an anatomic description. And only in the twentieth century did several diagnostic systems, in part simultaneously, evolve. Yet, as different aspects like anatomy, microscopy, and clinical behavior were taken into account, the comparison of entities of different groups was impossible. Only the advent of new methods, such as immunophenotyping, cytogenetic and molecular genetic techniques, finally allowed researchers and physicians to characterize the biology of lymphomas. An excellent example for this progress is the history of characterization of pediatric Burkitt’s lymphoma. Separating anaplastic large cell lymphomas from morphologically similar-appearing histiocytic or epithelial cancers was first enabled by immunophenotyping followed by genetic characterization. The development of successful treatment regimens for lymphoblastic lymphomas paralleled those for acute lymphoblastic leukemia. In contrast, for mature B-NHLs, the more condensed repeated block style treatment developed initially for Hodgkin’s disease showed better results than the ALL-directed more protracted continuous treatment. In 1999, an international cooperation created a common treatment protocol for anaplastic large cell lymphomas based on block therapy. For primary mediastinal B-NHLs, a chemotherapeutic dose escalation concept together with an anti-CD20 antibody treatment was successfully adopted based on treatment regimens for adults. 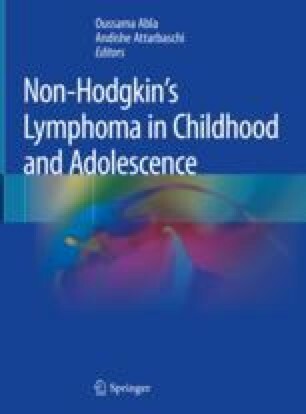 Altogether, the history of pediatric NHLs is an excellent example of how clinical and laboratory research are mutually stimulating fields, hopefully leading to better tolerated treatments and increasingly higher cure rates by implementing novel immunotherapies and specific inhibitors of tumor-related molecular alterations.